reminder of the October MCBA Visual Journaling Collective Meeting; reminder of Joyce Lyon’s new show opening. Above: This is the first page spread from that "weirdo" journal I'm going to be telling you about. But not today. Anyway, this book has built in tabs, you can see one in the gutter. 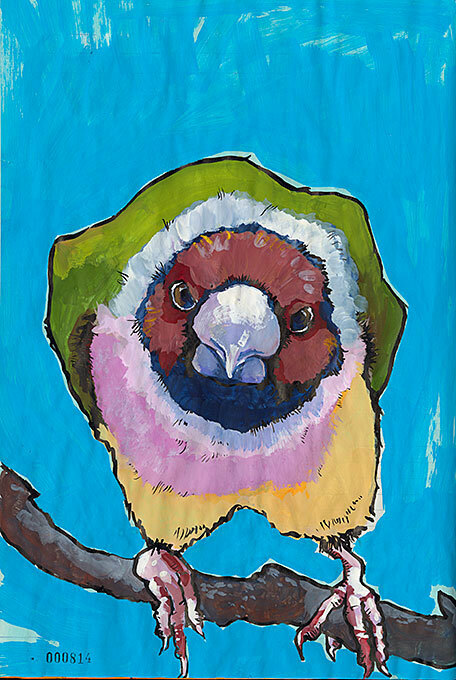 I sketched Gert with a Pentel Pocket Brush Pen and then slathered on the gouache. It's so fun to use gouache on a toned paper like this Magnani Annigoni Designo. Well I really thought Gert deserved her tail, but I didn't want to go onto the next page. I attached a scrap of Fabriano Tiziano that just happened to be lying in the scrap pile and also happened to be a tan. Then I finished my sketch. 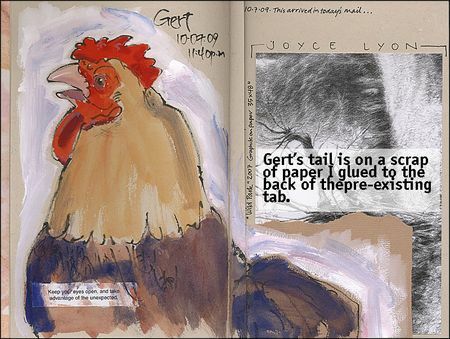 The type talking about "Gert's tail" (with a typo—no space between "the" and "pre-existing") was applied in Photoshop to draw your attention to the flap. Joyce Lyon…More about this fabulous artist below. 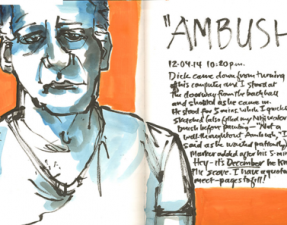 The year is winding down for the MCBA Visual Journal Collective. We have two meetings left. Monday, October 19 is one of them! Please come and join with other visual journal keepers to discuss Favorite Tools and Media. 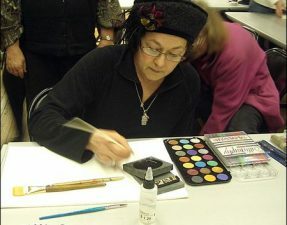 This is a great way for beginning artists to learn about supplies and gather usage tips. It's a perfect venue for veteran journal artists to pass on insights. We did this at one of our first meetings in the fall of 2008 and it was also a great way for people to connect with sketching buddies. Otricoli Drawings runs from October 23 to November 20 at the Traffic Zone Gallery, 250 Third Ave. N., Minneapolis. The opening reception is on Friday, October 23, 6 to 9 p.m. Joyce makes the kind of drawings you can look at for hours and hours and still find fresh nuances. Indulge yourself and go and see this show. I couldn't find any new info about the show up yet. But you can read about Joyce's 2008 show here. She is rerpresented by the Groveland Gallery in Minneapolis and you can view additional images on their site as well.